THE BUDDIES WHO’VE headed over to Pann’s from LAX let out a loud “yes!” when the chicken and waffles arrive. Nearby, ladies in elegant church hats sit in a red booth under ’50s-era chandeliers that look like inverted pyramids while, outside the wall-size windows, cars zoom by on La Cienega. It’s another typically photogenic Sunday morning at the coffee shop, but the image that captures my attention as I eat my short stack at the counter is the pair of rounded glass Bunn coffee pots filled with golden melted butter and syrup, warm and ready to pour. In my decade-plus of coming here, I hadn’t noticed them before, and the sight—the embodiment of high volume, old-school efficiency—is oddly gratifying. With a crowd waiting at the door, they could have gone with room temp on both. But golden and warm? That’s the extra step. 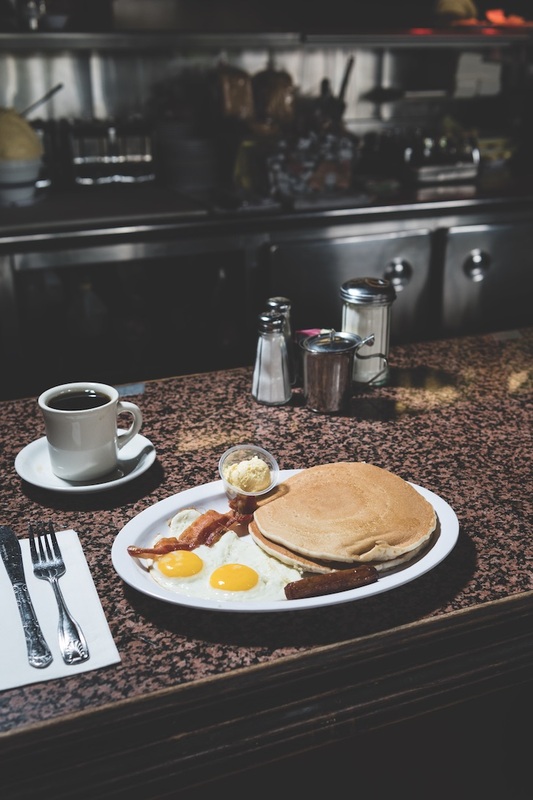 Although weighing in on new restaurants has been my occupation for 17 years, I’ve always found comfort in L.A.’s diners and coffee shops, those reassuringly frayed places whose twin engines are the griddle and the coffee urn, where Naugahyde thrives and they still call you “hon.” When I hear a short-order cook’s wide spatula draw across the flat-top and I look around a room filled with people living their lives, I feel a sense of belonging. We’re here for the food and the atmosphere, but as much as anything for the loose ritual of it all. Each place has a certain sameness that somehow defines its individuality; collectively they offer a glimpse of L.A. and its tidal rhythms that few other institutions can. At the Ocean Diner in Hermosa Beach, guys in board shorts wolf down biscuits and gravy as the sun rises. 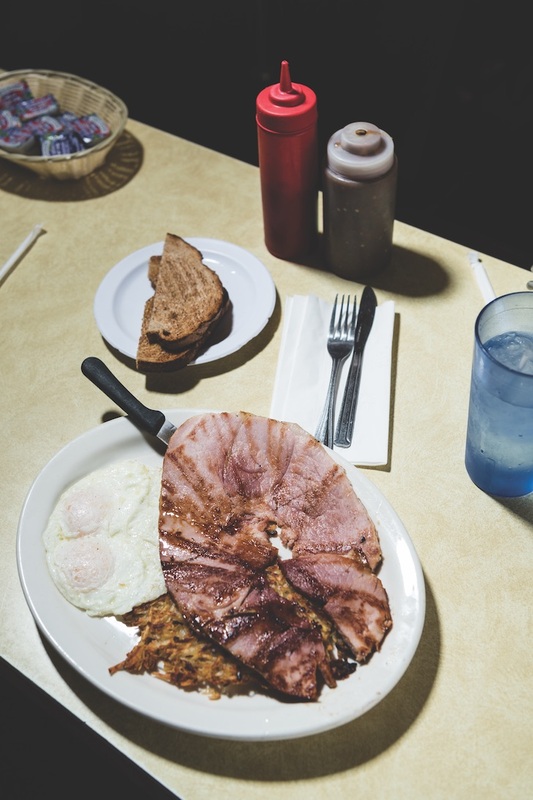 Midmorning, cops in their chevroned uniforms tuck into ham steaks around the horseshoe counter at Nick’s Café, the stucco-faced bunker east of Chinatown. Regulars don’t hold back from requesting their special tables at Bob’s Big Boy in Burbank. I don’t think there’s a more Chandleresque L.A. moment than—thick china coffee cup in hand—looking out the windows of the Denny’s beside the Wiltern as a late-night fog rolls along Wilshire, although sitting in downtown’s Original Pantry over a plate of hubcap-size pancakes at 3 a.m. may come close. As the Pantry’s signage proclaims, the joint has been around since 1924, which was probably a quarter-century before the interior mural offering 19-cent hot dogs and 24-cent tamales was painted at Nickel Diner on nearby Main Street. 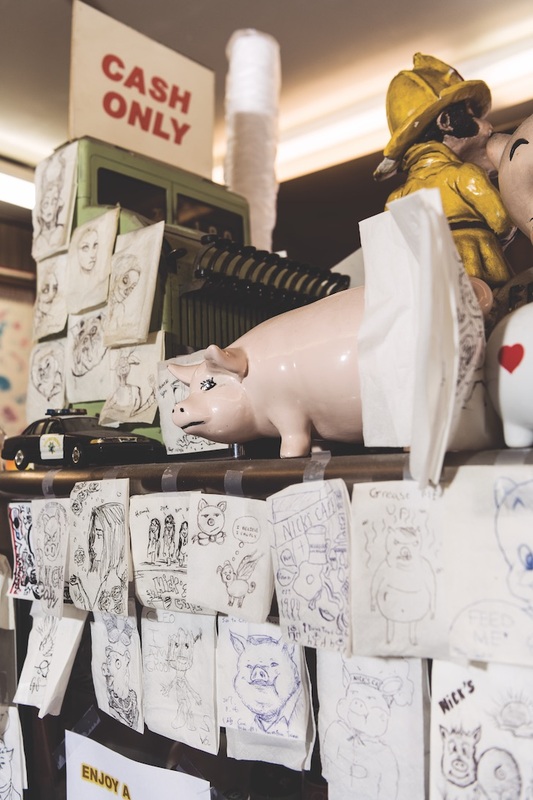 That ancient menu was discovered when the space was being prepped for the 2008 opening of the neo-diner, where the profoundly good barbecue pork hash meshes with the gritty theme. 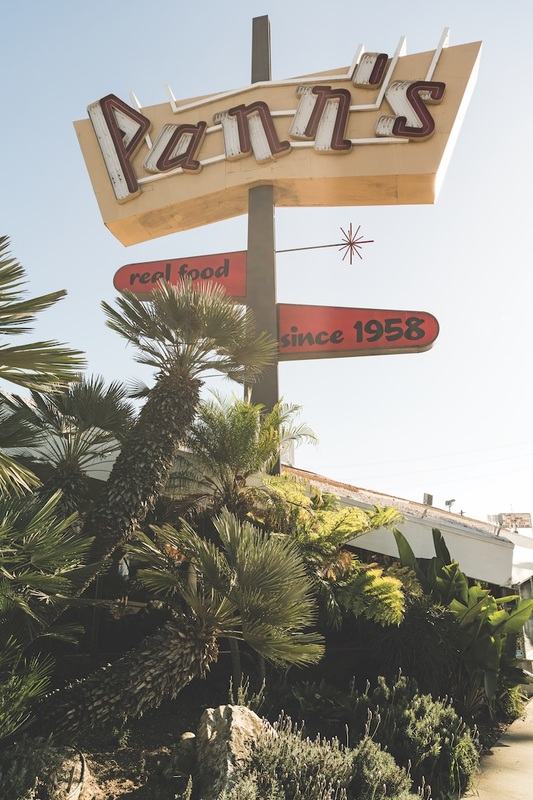 There’s a different kind of earthiness to the Pacific Diner in San Pedro, a simple cottage on a seaward slope, where the plates are as loaded down as the container ships that glide toward the gantry cranes of the port. Not far away, Long Beach’s Starling Diner stuffs its French toast with mascarpone, which is about as fancy as most coffee shops and diners get, unless you count the smoked tomato aioli Fred Eric slips into a turkey club at Fred 62 on Vermont. Eric transformed the restaurant in the 1990s from a stalwart called George’s with a little whimsy in mind—I love the way the bench seats look like they’re from an old Caddy—but it’s not just hollowly mimicking the past the way some chains do. With Fred 62’s awning, tail-finned moxie, pastel-green exterior, and simple lunch counter, you can easily see the connection to Rae’s, the teal classic in Santa Monica. That’s where I decided to take Richard J.S. Gutman when he was in town from Boston. 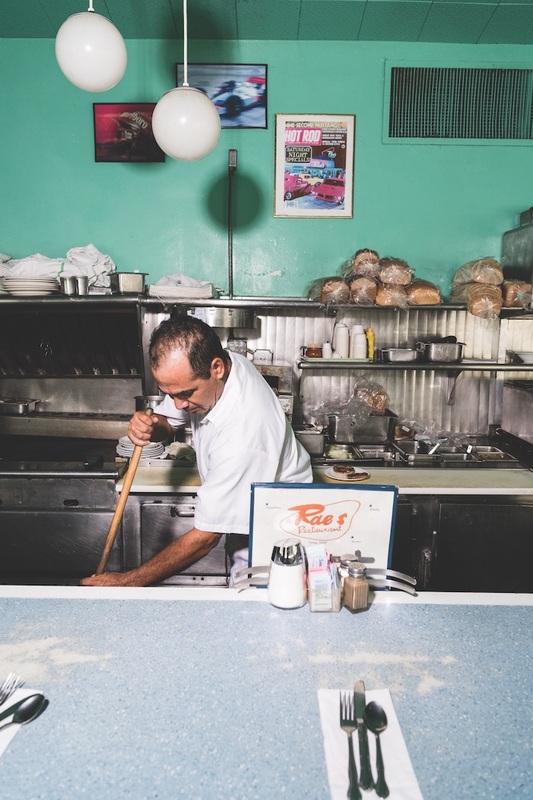 The author of American Diner Then and Now, he traces the origins of this kind of place to the all-night lunch carts that in the 1870s grouped around newspaper offices in Providence, Rhode Island. Outfitted with some stools fixed along a counter and facing the griddle in a tight 6-by-16-foot space, the long, narrow lunch wagons served ham and beans, egg sandwiches, and other staples to night owls and printing-press workers. That you could watch the cook prepping your food in a clean environment was a perk. Quick and convenient, the wagons anticipated fast food restaurants while hinting at aspiration by adapting the name of the railroad “dining car.” Using decommissioned train cars was an occasional gimmick; using a prefabricated model was more common. Mobility was part of the appeal to owners: When business fell off in one area, they could move the entire operation to a busier location. Rae’s doesn’t seem that much bigger than a railcar, but its clean lines and bright, humming lights point to a confident modernity. I’ve barely pulled off Pico into the parking lot when Gutman, unassuming in a Hawaiian-print shirt, points out the inlaid neon in the sign’s lettering and the wraparound metal trim on the eaves. “This is all original,” he says approvingly, snapping an image on his iPhone. A few days later I find myself at the North Hollywood Diner on Magnolia, where the celebrity head shots lining the walls put the collection of the average L.A. dry cleaner to shame. After having the meatloaf special and a slice of carrot cake thick with cream cheese icing, I walk around the corner to Lankershim and peer in at Phil’s, the city’s sole example of a barrel-roofed, railcar-style East Coast diner. Shuttered and disheveled, it is not a hopeful sight. Through the dark cellophane screens I can see the wooden ice chest, the ceramic inlaid floor, the griddle (a four-footer by the look of it), and three burners. One last order is impaled on the paper spike on the counter. Moving it from around the corner on Chandler wasn’t enough to save Phil’s, which had served Valley denizens since the 1920s. 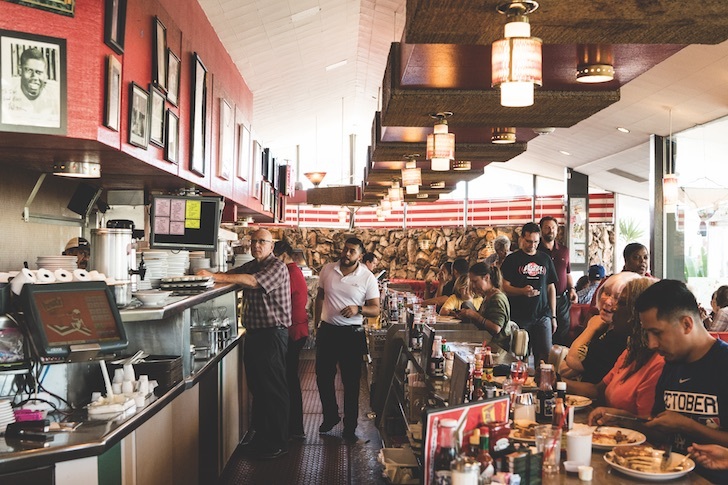 RAILCARS, COTTAGES, CUBBYHOLES—diners and coffee shops come in all shapes and sizes, and the structures themselves can feel almost as placeless as they feel timeless. But that’s where restaurants like Pann’s stand apart. Born out west in the middle of the last century, with unlikely angles and fog-cutting color schemes, they came about at a time when the space-age future swooped skyward in the form of ornate trusses supporting crazily oversize signs. The source of such fun-loving verve was Googies Coffee Shop, which finished building its first location in 1949, at Crescent Heights and Sunset. Designed by John Lautner, it was a low-lying rectangle with huge windows and a mod, blocky lowercase font; a tilted section seemed to launch the red metal roof into orbit—or at least toward the old mansard-roofed Schwab’s Pharmacy next door. That same year Wayne McAllister finished work on the streamlined sweep of Bob’s Big Boy in Burbank. 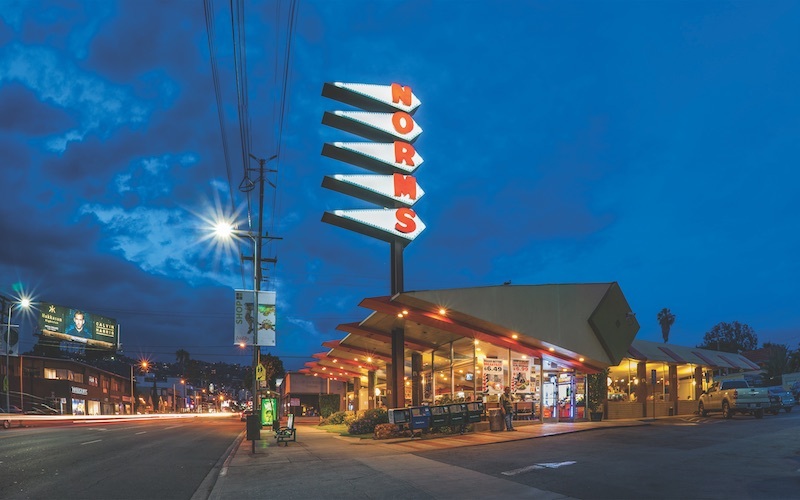 Two years later came the opening of the Douglas Honnold designed Tiny Naylors, a drive-in at Sunset and La Brea with a massive porte cochere shaped like a supersonic jet. The place embodied the style in an optimistic tumult of fronds, stacked rock, starbursts, and terrazzo floors. The originality and lighthearted intensity of such establishments provided a sense of occasion yet kept the refills coming. They were Mies van der Rohe’s Four Seasons for the people. Few architects took this propulsive design further than Armet & Davis, a firm whose buildings became the stuff of legend while remaining the destination for lunch. That was the team behind Pann’s as well as Johnie’s, at Wilshire and Fairfax. I had to wait until the long shuttered coffee shop became the Bernie Sanders headquarters to run my hands along the orange Naugahyde stools, but that it stands at all is a result of the swift demolition in 1984 of the Ships that Martin Stern Jr. designed at Wilshire and Glendon; outrage over the loss was enough to lead to the formation of the Modern Committee of the Los Angeles Conservancy, which has saved dozens of irreplaceable buildings. Alas, you can’t include the Norms on Pico near Sepulveda on the list; it was torn down earlier this year. Biff is recounting some of this history as we sit in the Studio City Du-par’s. He’s owned the place (along with the one at the Farmers Market and two other locations) for 11 years, but, casual in a button down oxford shirt, he seems like any other customer as he has one of his occasional lunches with 82-year-old Danny Avila, a compact featherweight who started at the Biffs at Yucca and Cahuenga in the early ’50s. “I was a fry cook,” Avila says with pride before taking another bite of his chicken salad. In a minute, the nostalgia kicks in. “A draw was a coffee,” says Avila. In my mind’s eye, I can see Naylor in the yellow-striped brown pants he wore when he was a soda jerk trainee and Avila in the neat whites he sported behind the grill. What’s interesting is that, even as menus have evolved since Avila’s day, they remain pretty true to his version. At the Hungry Fox in North Hollywood, you can get a breakfast burrito with Thai sausage, or chicken and waffles with a sweet chile sauce, but here, too, it’s ultimately about the generosity of time, space, and refills, with food that is simple, comforting, and born of the griddle. 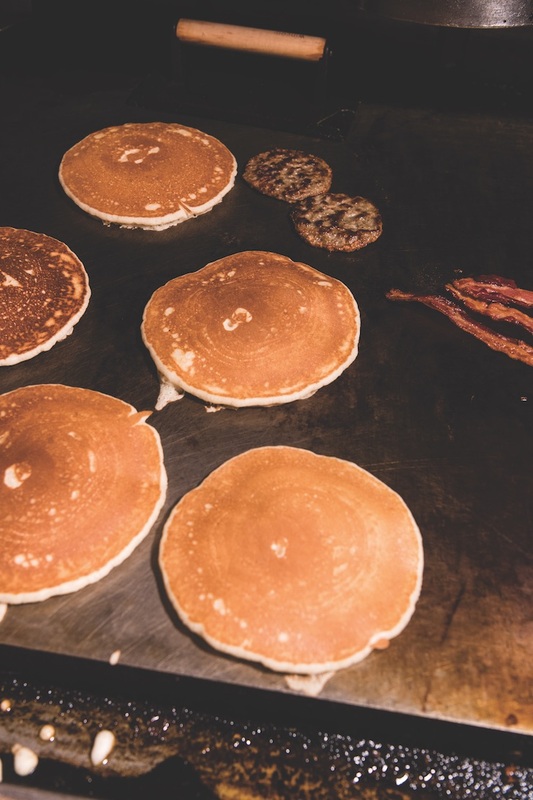 The oiled, blackened surface of a flattop—crusted in parts, smooth in others—allows the skilled short-order cook to navigate the hot spots, knowing where to lay down the pancakes, where to heap the home fries, and where best to stretch out the bacon, employing a hand-iron weight so the ends don’t curl. I’ve spent hours at the stool nearest the cash register at the Norms on La Cienega watching the ballet of orders coming in, tickets beings snatched by chefs, and plated food heading out onto the floor. I like the simplicity of the place, but the same choreography is being performed at diners and coffee shops all over the city throughout the day. The last time I slipped into a tufted banquette at the Brite Spot in Echo Park for the whole-grain avocado toast enhanced with two eggs, it was noon for most of the city, but for the groggy-eyed stragglers who came for the Soyrizo scramble, it was just the start of the day.